Tenosynovial giant-cell tumor also known as pigmented villonodular synovitis (PVS) is a benign but aggressive synovial proliferative disease most often affecting the knee joint. The mainstay of therapy is surgical resection. Due to a high rate of local recurrence, radiosynoviorthesis (RSO) is used as an adjuvant method in many cases. The aim of this study was to compare local recurrence (LR) rates after surgical synovectomy with and without adjuvant RSO. 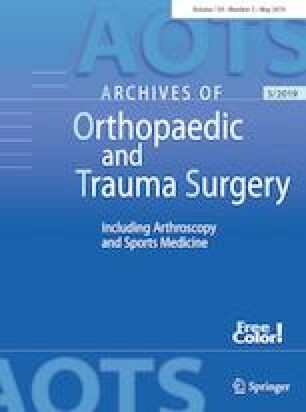 From 1996 to 2014, 37 surgical interventions were performed in 32 patients with diffuse pigmented villonodular synovitis of the knee. All patients underwent open synovectomy. Adjuvant radiosynoviorthesis (RSO) was applied in 26 cases, the control group consists of 11 cases without RSO. 9 (24%) lesions recurred within a median of 19 months after surgery. Of those 9 recurrences, 3 (17%) were seen in primary disease, 6 (32%) in already recurring cases (n.s.). In 26 RSO treated patients 6 (23%) recurred, in 11 patients of the control group, 3 (27%) recurred (n.s.). RSO is effective in PVS as also shown in some smaller reports in the literature. But surgery is still the mainstay of therapy. RSO is not a method of compensating for an insufficient surgical approach, but it may reduce the high rate of LR in patients with large and even recurrent diffuse forms of the disease. All authors have no financial and personal relationships with other people or organizations that could inappropriately influence (bias) this work. This study was not supported by any grants or external funding. This study was approved by the ethics committee of the Medical Faculty, University of Munich. Written consent was obtained from all patients included in this study.